Beat the eggs and milk or cream together. Heat the butter in a medium-sized frying pan and when heated, pour in the egg mixture. Cook over medium-heat until the omelette is set at the bottom but still runny at the top. Cook omelette to preferred taste. 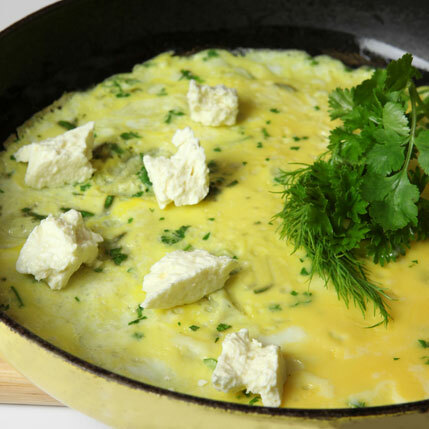 Sprinkle the feta over and loosen the sides of the omelette. Serve immediately with extra fresh herbs, if desired. Serve with a slice of toasted seed bread.